On Wednesday, Jan. 10, David Samson called the Street Roots office for his fiancé, Bettyjo Griffiths. His message: Come quickly, their camp was being swept. Before Bettyjo left, I asked if she would like me to come witness. “Yes,” she said, and I soon followed. There are camps all around the city about which I know very little. But this camp? Because of Bettyjo and David, I knew a few key details. They are a warm and supportive couple, not only of each other, but their neighbors in the camp. Recently David had brought in a neighbor to become a Street Roots vendor. They had also told me about another neighbor, an elder on a fixed income. Yet another was young and struggled with mental illness and addiction. “It took nine months for her to trust me,” Bettyjo explained, but once the woman did, she found a support system in Bettyjo and David. I also knew that they had housing not long ago with David’s father in the Hawthorne neighborhood, but they understood when he needed to move, and they settled in this camp, staying in the neighborhood. During the recent election, they propped up a “Yes for Affordable Housing” lawn sign, explaining that they all needed affordable housing, and they were proud to support the campaign for the Metro bond in a location where cars drove off the Hawthorne bridge. And I knew that they were working hard to get housing. Bettyjo figured that it costs "$900 a month to be homeless” – between food, laundry, truck-shop showers, bus passes and a storage unit – and they needed more to get indoors. So they enrolled in the pilot program Mercy Corps Northwest launched with Street Roots vendors, matching $600 in savings with a $3000 grant toward housing expenses. On Saturday, Bettyjo and David are set to attend their first Rent Well class, the final component of the program. I arrived at the camp nearly the same time as Bettyjo. David described how Pacific Patrol Services – which contracts with the city – had arrived, as well as three police cars and the Clean Start program of Central City Concern, which regularly helps them with trash. After clearing a northern portion of the camp, authorities left David and Bettyjo’s camp and several others alone. David said a Pacific Patrol employee told him their portion would be dismantled the next day. David quickly got on the phone with a member of Saint David of Wales Episcopal Church, where they attend services, as well as sell Street Roots on Sundays. The community member told David that members would come the next morning and help the couple pack up their belongings to place in storage. 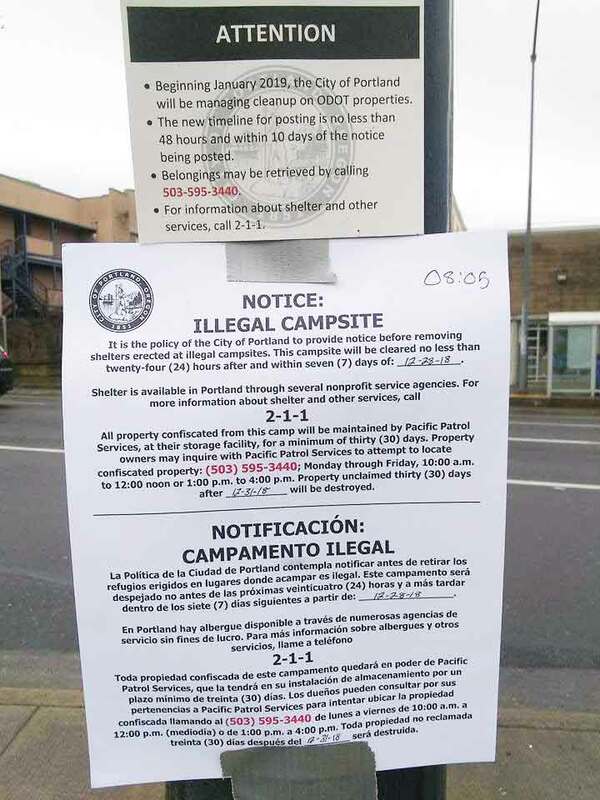 David showed me a photograph of the “illegal campsite” posting that declared City of Portland intention to remove shelters and confiscate property. Above that posting was another sign: "Beginning January 2019, the City of Portland will be managing cleanup on ODOT properties." I returned the next day to a very different scene. Bettyjo and David's tent was gone. The rock cairns remained, like steadfast witnesses. I looked around the bowl-shaped grassy area – almost an ampitheater – tucked against the Hawthorne Bridge. Three people remained, churning through piles, folding tarps, occasionally taking stock. Everyone was quietly busy. I walked up to a man who introduced himself as Mike. Bettyjo and David got out earlier in the day, he said, and they had a place to stay for the night. Mike described how he looks for cans all night and sleeps during the day. That was how he planned to weather this displacement. "I will probably keep my things packed up for a couple of days and then go right back here," he said. He named some other possibilities, including the river. A woman wandered through brush nearer the bridge, shouting. I jolted my attention toward her. "Don't worry about her, she's smart," he said. After thanking him for his time, I wandered over to the spot next to where Bettyjo and David had camped. I met another Mike – Michelob Mike is how he introduced himself – whose tent was the only one still pitched in this bowl of earth. At sixty-five, his hair was still blond, packed under a black beanie. He was a striking figure, standing tall like a sentry at his tent. Like the other Mike, he chatted quite a bit, wavering from brief stories of his traveling life to reflections on what gave him meaning ("people still need my counsel") to concern over what would happen next. He had no plan. He relied on social security, and that wasn't enough. He still had a lot of packing to do, but no where to take his belongings. "I'm not supposed to exist," he said suddenly, looking around. He reminisced about how he first arrived at the camp six months prior, and earned the friendship of his neighbors. I asked him, as I asked the other Mike, and Bettyjo and David the day before, if they had ever faced an "illegal camping" posting in the months prior on this land. No, was the answer, again and again. The Oregon legislature passed the intergovernmental agreement last February, and the city of Portland worked out the details in recent months. I had hoped that at least there would be some consistency around the communication, because now both jurisdictions would use the same warning period: Authorities come (usually city contractors Pacific Patrol Services and Rapid Response) between two and 10 days after the initial posting. The city of Portland tracks with more transparency. Now I have a nagging concern, one that I'll explore in the months ahead. The notice that David showed me was posted on Dec. 28, 2018. The intergovernmental agreement began on Jan. 1, 2019. The moment that the city of Portland had the jurisdiction to sweep, they did.